The Abnormalities of Stringent Strange by Rhys Hughes ebook is now only $2.99! 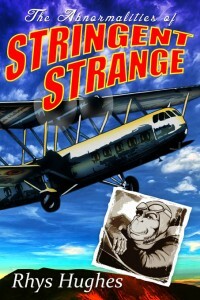 The world has never seen an aviator quite like Stringent Strange. Half man, half ape, half badly added fraction, he can fly anything with wings and many things without. Under the mentorship of the unorthodox genius Professor Tobias Crinkle, our hairy hero soon gets much more than he bargains for when he finds himself up against a fiendish Nazi plot to invade and conquer America before the war has even begun! Come and join Stringent Strange in a stupendous, mysterious, inventive adventure set in a far-flung time When Pulps Collide!